The former Kim Hua Market may have left its fishmonger and butcher days behind, but since 1986, this old market has found its true calling: serving authentic Singaporean food to an unending and unceasingly hungry crowd of both locals and tourists, as Maxwell Food Centre. The market building has stood here since 1935: now devoid of its market stalls, over a hundred cooked food stalls have taken over, arranged in three rows under a steel roof. Efficient in appearance, Maxwell Food Centre makes no pretensions to the atmosphere or high class: instead, it lets the collective reputation of its best-selling tenants do the talking. How to get there: You'll find Maxwell Road Food Centre in Chinatown; to get there, ride the Singapore MRT and disembark at Chinatown MRT Station (NE4) - take Exit A to Pagoda Street, walk down the lane until you hit South Bridge Road. Cross as soon as you can, and walk south down South Bridge Road until you reach Maxwell Road Food Centre (Directions to Maxwell Road Food Centre on Google Maps). The Maxwell Food Centre takes on all comers - taxi drivers, students, office workers, and tourists. It doesn't have the tourist-trap reputation of Lau Pa Sat Festival Market or Newton Food Centre, despite its location in the hottest of tourist hotspots. Some of its stalls have gone on to lasting fame, with glowing endorsements from celebrities like Anthony Bourdain and the Michelin Guide. Central Chinatown location: Maxwell Food Centre is only a few minutes' walk from the Chinatown MRT and is set on one of the main arteries running through central Singapore—South Bridge Road. You get plenty of foot traffic walking through this part of Chinatown—tourists taking a breather from exploring the stores and temples near Temple, Smith, and Pagoda Streets, office workers from having their lunch break, the works. Open for long hours: The place doesn't run on all 24 hours, but you can be sure of finding something to eat between 8 am to 10 pm on weekdays, and all the way up to 3 am on Friday and Saturday evenings. Low cost: Surprisingly for a tourist hotspot, Maxwell Food Centre manages to keep prices low. SGD 3 is the going price for a steaming hot bowl of lor mee or bee hoon; a plate of popiah will set you back a mere SGD 1. You can have a filling meal at Maxwell Food Centre for no more than SGD 6, or about $4.75! Famous hawker stalls: A remarkable number of Maxwell Food Centre stalls have exceeded the average Singaporean's exacting standards for good food: some stalls have achieved fame from glowing celebrity endorsements (Tian Tian Chicken Rice got Anthony Bourdain to rave about its product, for instance). Bourdain endorsed it wholeheartedly, and the famous Michelin Guide concurred: Tian Tian Chicken Rice (Stall 10 & 11) is quite simply the best Hainanese chicken rice in Singapore, as evidenced by the long lines waiting to buy the stuff. The chicken rice served at this stall—served cold, as Hainanese chicken rice is immediately dipped in an ice-cold bath after boiling—comes on top of a bed of chicken fat-rich white rice and what Bourdain calls the "holy trinity of condiments"—shredded ginger, thick soy sauce, and chili sauce. Tian Tian's chicken rice appeals to purists: every bite combines the soft-spoken umami of the chicken with flavor highlights provided by the condiments. Patrons can mix and match the condiments to taste; whether you dip your chicken in or drizzle the lot over the chicken and rice can be a source of heated debate among friends. 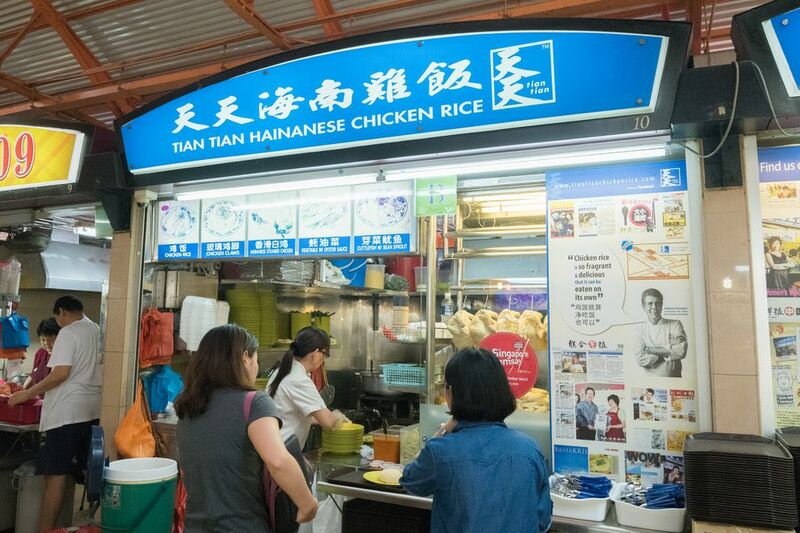 If the line is just too long for your grumbling stomach, go to Ah Tai Hainanese Chicken Rice (Stall 7), founded by a former Tian Tian chef: for shorter waiting times, you get a comparable dish of chicken rice. Zhen Zhen Porridge (Stall 54) is often beset by long lines of hungry customers, but once you get served, you'll love what you get: a silky bowl of rice porridge filled with fried shallots, chicken slices, spring onion, and century egg. Order the yu sheng rice porridge, which is garnished with raw fish slices. 5:30 am to 2:30 pm, closed on Tuesdays. Jin Hua Fish Head Bee Hoon (Stall 77) serves a Cantonese-style fish head noodle soup. The broth is milky, enriched with bee hoon noodles, vegetables, fried shallots, and vegetables, with a dash of sesame oil. Each bowl is prepared individually for each customer, which accounts for the constant long lines in front of the stall. 11 am to 8:30 pm, closed Thursdays.